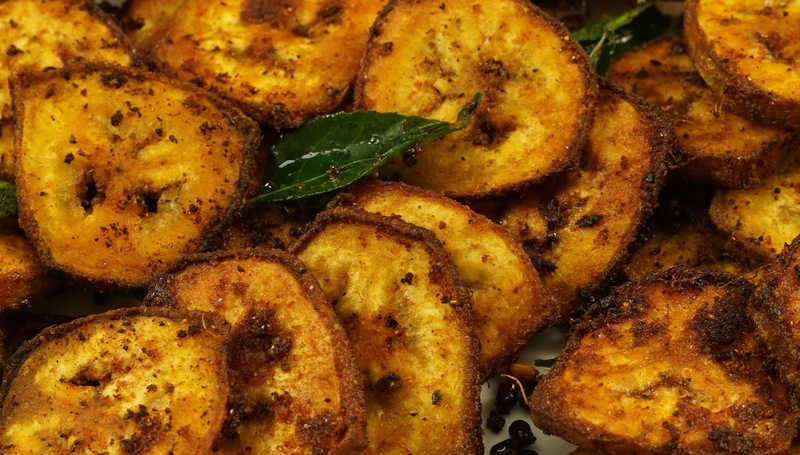 Raw Banana Fry / Vazhakkai Varuval / Valakkai fry is one of my favorite side which my mom makes very often. this is an awesome companion for variety rice especially with lemon rice and curd rice. I am big fan of this recipe because we need only less oil to make this dish and it still tastes like the one which we deep fry in the oil. Not only for this recipe i am big fan of the entire tree itself because it has a lot of medicinal values and all the parts of the banana plant is edible.Stem of the plantain is used for making poriyal (vaalaithandu poriyal) , the flower is also used to make poriyal (sidedish), we can also make vadai with the plant's flower. Moreover the fruit " banana " tastes wonderful and is good for health. Step 1) Peel the skin of the raw banana and cut it into roundels. Do not cut them very thin as we do for banana chips it should be a little thick. Step 3) season the cooked raw banana with Turmeric powder, Garam masala, Chili powder, salt and pepper. mix it well and make sure all the sides are nicely covered with the masalas. Step 4) Heat oil in a pan ,add mustard seeds and urad dal. mix it once and add the seasoned raw bananas, placing it flat on the surface of the pan. Cook until it turns nice and crisspy, once crisp flip it to the other side and cook until both the sides turn golden and crispy. Step 5) Finally add curry leaves and turn off the heat.Drain the oil and continue the same with the \ next batch. Our easy and delicious valakkai fry is ready to be served with rice. You can also deep fry the recipe to make it very crispy but less oil makes this dish more healthy and guilt free dish.This Valakkai fry is very quick and easy to make hassle free recipe. Please do try the recipe and share your feedback .Happy Cooking. Raw banana fry is a side dish recipe made with raw banana and seasoned with indian spices.It is a great companion for rice varieties and taste awesome with curd rice.It is a traditional south Indian recipe called valakkai fry. Looks yummy..But do you really use 2 tsp oil to get this roasted finishing..